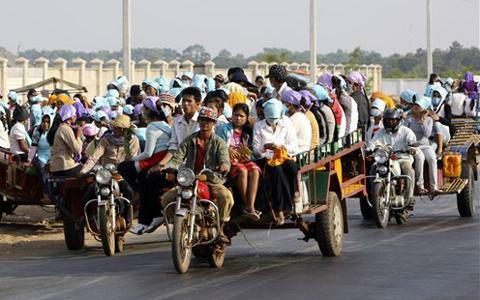 Cambodian garment factory workers travel together in motor carts to get home from work at the Sala Lek Pram village, Kampong Chhnang province. Trade unions say they are concerned that a draft law under consideration by the government will be used to attack or dismantle group’s that do not follow the government line. Concerns over the draft law echo similar worries by NGOs on a draft law to further regulate that sector. Among their concerns are provisions in the draft that requires a request for registration, a list of dues-paying members or other leaders, and report requirements of an action plan to the government. The law also allows for unions to be dissolved by court order following complaints by a third party or the government. It also allows for fines of between $500 and $2,500 and jail sentences as high as three years for union leaders in breach of regulations. Rong Chhun, president of the Cambodian Free Trade Union, said the draft would silence union leaders and seriously restrict the rights of unions. 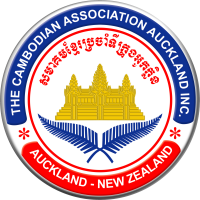 He called the draft in contravention to the International Labor Convention and the Cambodian constitution. Moeun Tola, an official at the Community Legal Education Center, said the draft law provides a system of permissions for trade unions and hands more power to the Ministry of Labor in approving unions. However, Huy Han Song, undersectary of state for the Ministry of Labor, said the draft was aimed at “social harmony” and not to pressure any certain group. Cambodia’s sometimes unruly garment sector has 62 different unions, though some of those stand by government and factory owners, according to union leaders.